Imagine your logo or design on virtually any type of garment, bag, towel, hat, blanket or jacket - Instant Imprints can deliver with our branded apparel and embroidery services! When you are looking for the highest quality as well as the convenience of a local provider, we are your source. Our state-of-the-art centers have multiple embroidery machines to provide you with anything from individual personalization to thousands of units. Our product offerings are unmatched in the industry. With brands such as Nike, Perry Ellis, Port Authority, Dickies, Cutter & Buck, Tommy Bahama, PING, PGA Tour, Calvin Klein, Cubavera, Ashworth, Callaway, IZOD and Antigua - to name a few. You can count on our services to make your next meeting, event or promotion a success. With our global buying power, Instant Imprints is also a cost effective resource for you. We invite you to visit one of our extensive local showrooms to see samples of products and our quality. Your Burlington Instant Imprints® provides a custom embroidery service that helps your business thrive. 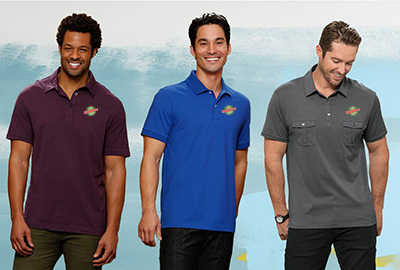 Custom stitching can help foster a connection between your customers and employees as well as among employees themselves, as personalized work shirts and corporate apparel put workers and customers on a first-name basis with each other. Gifting an especially valued customer to a piece of custom embroidery apparel is a great way to show them how much you value their business. Custom apparel and embroidery brings a level of sophistication to your business that helps set you apart from your competitors. By professionally representing your brand values, employees can proudly display that they’re part of a business community that values connection and fellowship. Whether on the job or off, employees who show off your custom embroidery are spreading your brand values wherever they go. From Burlington to the Bahamas, your custom apparel can bring your logo wherever folks may travel. To see some samples of custom embroidery in action, check out our gallery. Custom stitching displays a level of professionalism to your customers. For them it’s a sign of success, showing that you’ve reached a certain level of legitimacy and that you care about the details. When a customer approaches an employee that is sporting your branded apparel, they know that they’re getting a high level of service and will feel more comfortable approaching them. Custom stitches are essentially mobile billboards on the backs of your customers and employees—they create a business buzz wherever they go. Whoever wears your custom clothes will be helping to promote your brand. Besides the superior elegance that custom embroidery provides, another main benefit is that it’s one of the most durable ways of customizing clothing. Your custom embroidery may even outlast the garment that it’s stitched on! Custom stitching can be applied to virtually any type of clothing or cloth, from pairs of socks to varsity jackets. Let creative custom stitches set you apart from the competition! At Instant Imprints, we serve all types of projects, big or small. Our custom embroidery service has no minimum order, so you can individualize your goods for your team members, or have a large uniform production across the board. Whatever promotional path is right for you, our Image Experts will work to understand your goals and answer any questions you have in a timely matter. Get started on your path to custom embroidered apparel and get a powerful boost to your brand visibility by stopping in at our Instant Imprints Burlington showroom today. You can also give us a call at (905) 637-2828 or request a quote online to start stitching together a brighter future for your business!